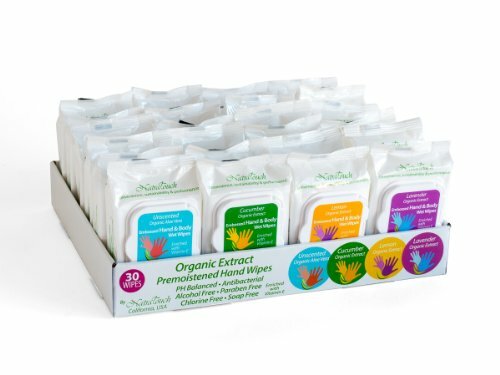 NatraTouch soft embossed textured organic hand & body wipes clean, sanitize and moisturize naturally. Using NatraTouch hand and body wipes stops the spread of germs and keeps your skin clean, refreshed and healthy. Perfect for quick clean-ups of dirt and messes. NatraTouch Wipes are made from GMP factory. GMP refers to the Good Manufacturing Practice Regulations promulgated by the US Food and Drug Administration under the authority of the Federal Food, Drug, and Cosmetic Act. Organic Cucumber, Lavender, Lemon and Aloe Vera Extract from California Certified Organic. Alcohol Free, Paraben Free, Soap Free, Antibacterial. Not Tested on Animals, Enriched with Aloe Vera and Vitamin E.
If you have any questions about this product by NatraTouch WorryFree, contact us by completing and submitting the form below. If you are looking for a specif part number, please include it with your message.